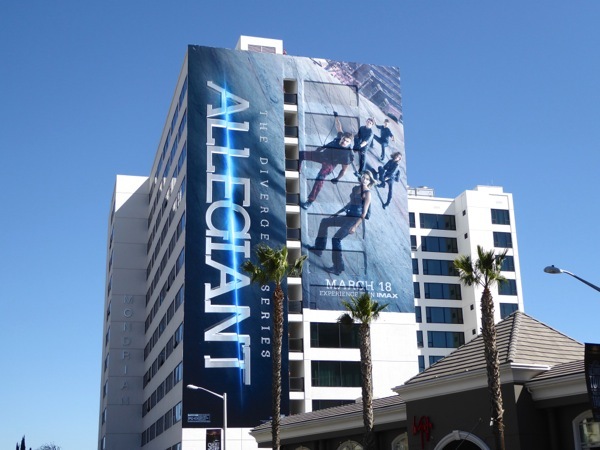 Many young adult literary adaptations have tried and failed to match the blockbuster status of The Hunger Games movie franchise, but The Divergent Series has been able to enjoy worldwide box office success. 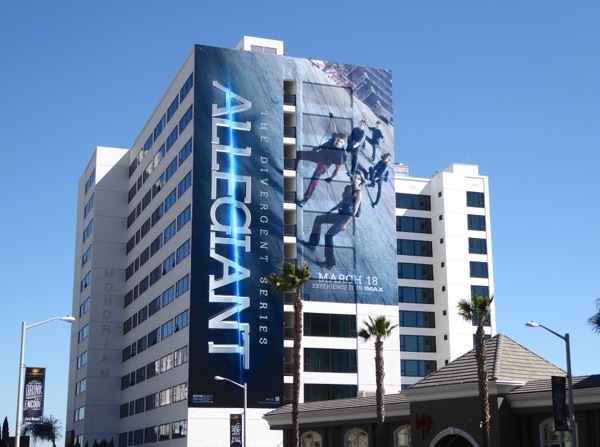 The futuristic sci-fi film franchise is also following the same strategy with Veronica Roth's final installment and splitting the final book in the trilogy in two, with Allegiant this year and Ascendant concluding the series next year. 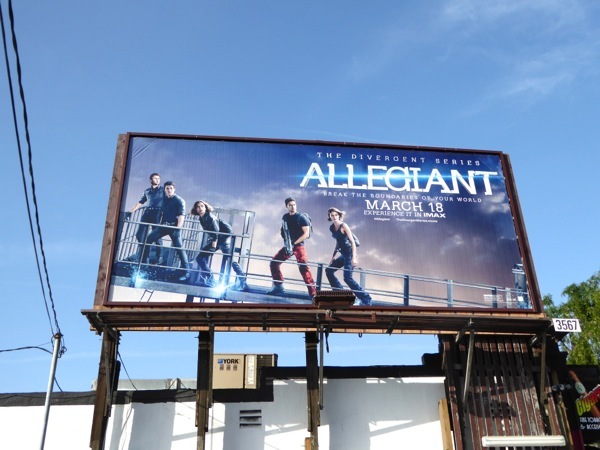 Following the revelations of Insurgent, Shailene Woodley's 'Tris', Theo James 'Four' and their friends must venture outside the wall surrounding dystopian Chicago to discover what truly lies beyond the world they thought they knew. 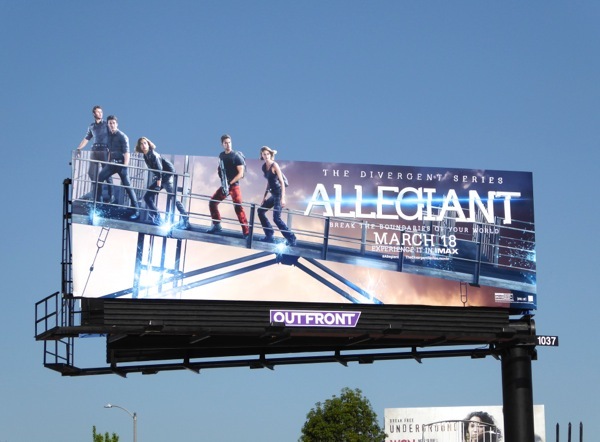 In the first movie, Tris rejected the 'Abnegation' faction she was born into when she discovered she was genetically 'Divergent', possessing attributes from multiple factions, and joined the 'Dauntless' faction. 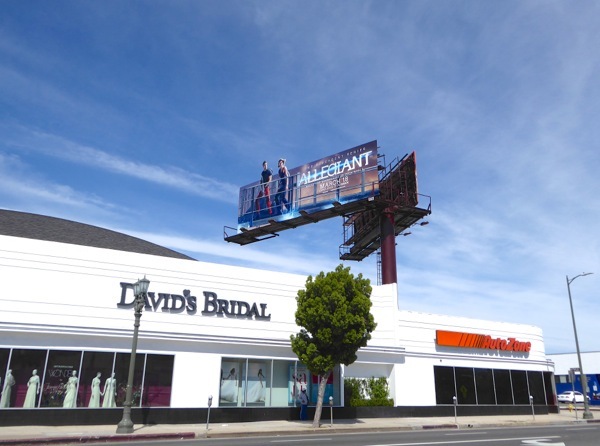 She soon discovered that Erudite leader 'Jeanine' (Kate Winslet) wanted to take over the all five factions with a mind-controlled Dauntless army. Even with the death of her parents and betrayals by friends and family, she ultimately foiled this attempt only to find out that the entire faction system was an experiment conducted by the people beyond the wall. Now who can Tris trust, and what is the real truth? When this movie franchise first launched there was very little outdoor ad support, but two movies on and this is no longer the case. 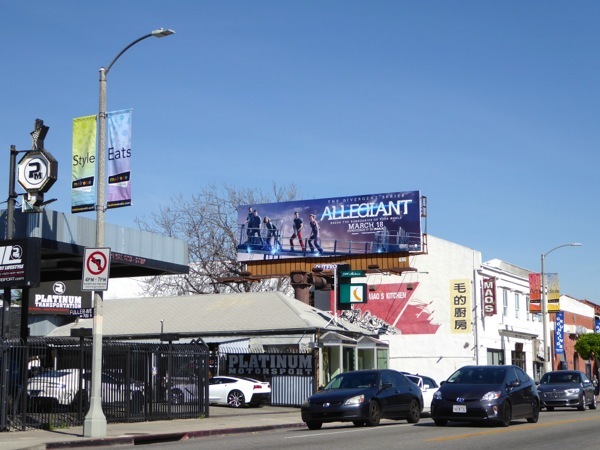 The eye-catching standard landscape and special extension cut-out billboards were first spied popping up around L.A. along Melrose Avenue and La Brea Avenue on February 24, whilst a smaller version was photographed along Santa Monica Boulevard on March 13, 2016. 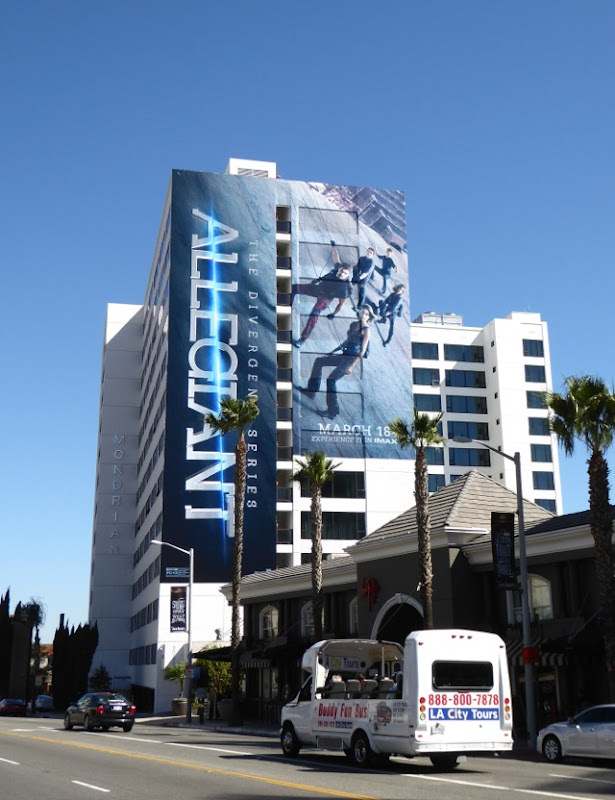 Meanwhile the super-sized abseiling ad creative, which perfectly suits the side of the Mondrian Hotel, was first snapped making an impact along the heavily trafficked Sunset Strip in West Hollywood on March 3, 2016. 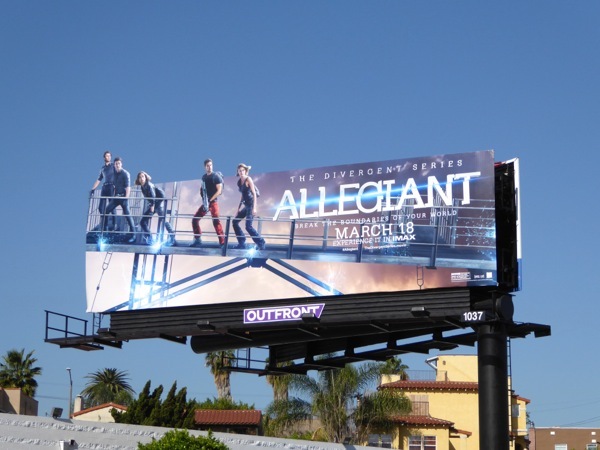 Fans of The Divergent Series should also check out these Insurgent movie billboards from 2015 and these Divergent movie billboards from 2014. 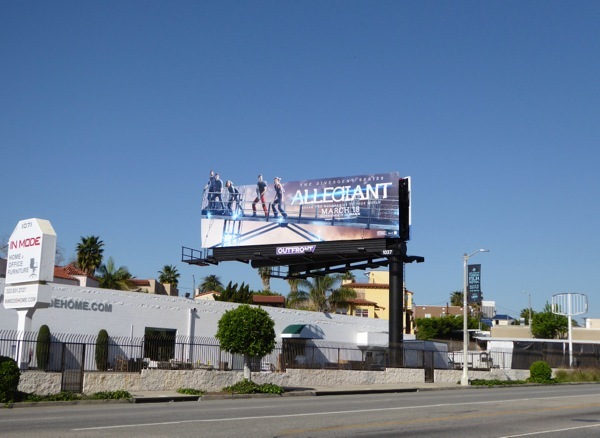 Let's hope this penultimate installment in the saga doesn't leave the same bitter taste with cinema goers that The Hunger Games: Mockingjay did, when it stretched out the final book over two films and left fans dangling for a whole year after a lackluster part one. 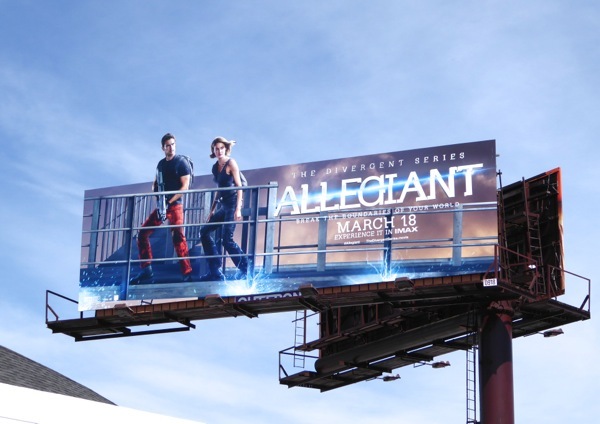 UPDATED: Here's another special extension billboard which zooms in on lovebirds Four and Tris to great effect. 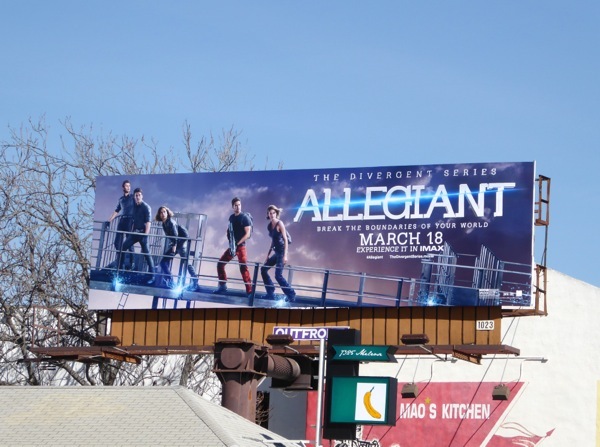 This version was snapped along Pico Boulevard on March 22, 2016, although sadly none of these cool billboards have been able to help Allegiant out with a disappointing box office and bad critical reviews.